Hire someone else to do it for you. *Just kidding — we’re totally biased. Renting your own truck to move has its pros and cons. It allows you to move at a leisurely pace, but do you really want to spend 15 hours or more moving your home? 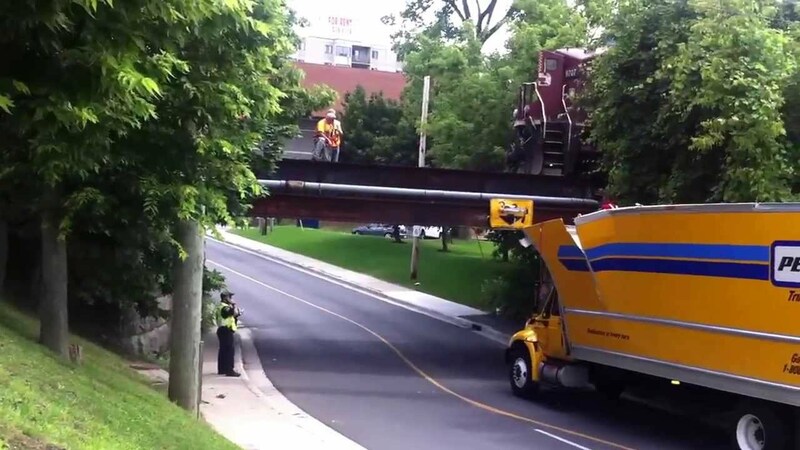 If you do elect to rent a truck and do it yourself, we recommend making yourself a nuisance with the rental company. They probably — probably — keep reservations the majority of the time, but when I started out, I was left high-and-dry on more than one occasion when I was renting trucks 100 percent of the time, particularly with one company. I’d make a reservation a few days in advance only to discover that the local branch had already rented all of their trucks for the day. So, check in at least once you’ve reserved your truck. Rates: These will vary depending on the time of month and the time of year, as well as availability. 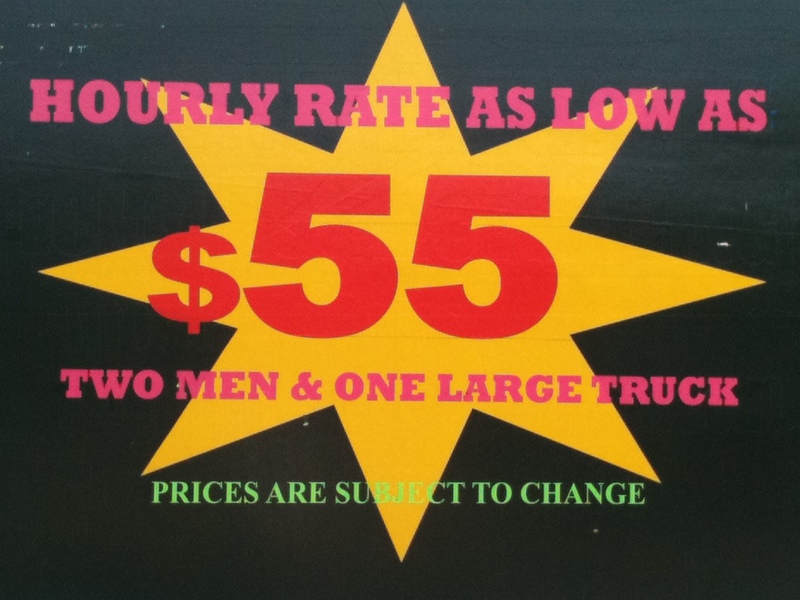 Since it can vary wildly, it’s tough to give a range, but expect between $30 and $150 for the bare bones daily rate. The $29/day rate some places advertise? Yeah, maybe if you catch them at the right time. The most in-demand (and therefore most expensive) times to rent are between late March and early September. The end of every month, no matter what time of year, will see a higher demand, and therefore higher rate. 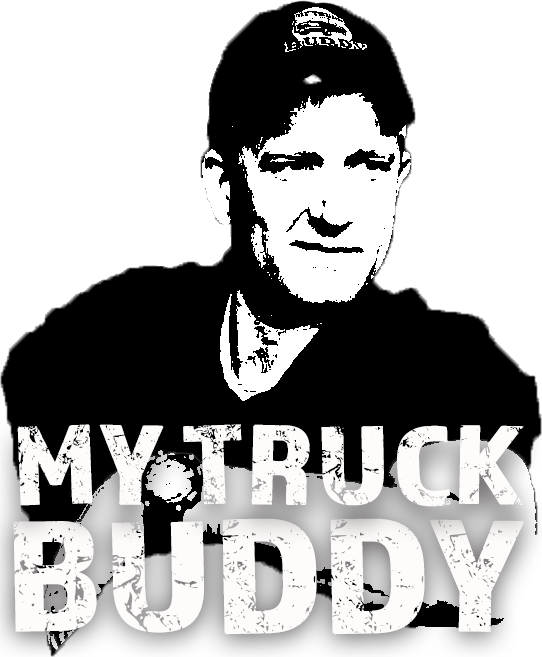 Whatever the case, you’ll get a better rate if you book a truck well in advance. Mileage: Remember – you’ll be charged mileage from the second you leave the rental place until you return the truck, NOT just for the distance between your new and old places. Supplemental insurance: These companies will ask if you want to buy their supplemental liability insurance. 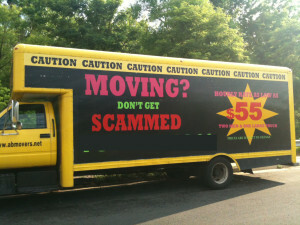 I know you’re probably feeling tapped out with all the other moving expenses, but this can be a big one. Definitely get it. In the picture above, without supplemental liability insurance, that customer could be on the hook for well over $4,000. Extra expenses: A rental truck does not come with moving pads or blankets, tie-downs, bungee cords or dollies and hand-trucks. These are all extra expenses. Most places (like U-Haul) offer a fantastic daily rate, but they hit you with exorbitant mileage costs. Gas: There’s also gas to take into account which, these days, isn’t terrible, but let’s face it — these trucks aren’t the most fuel efficient in the world. The bottom line: rental companies advertise some great rates, but that’s just the tip of the iceberg. 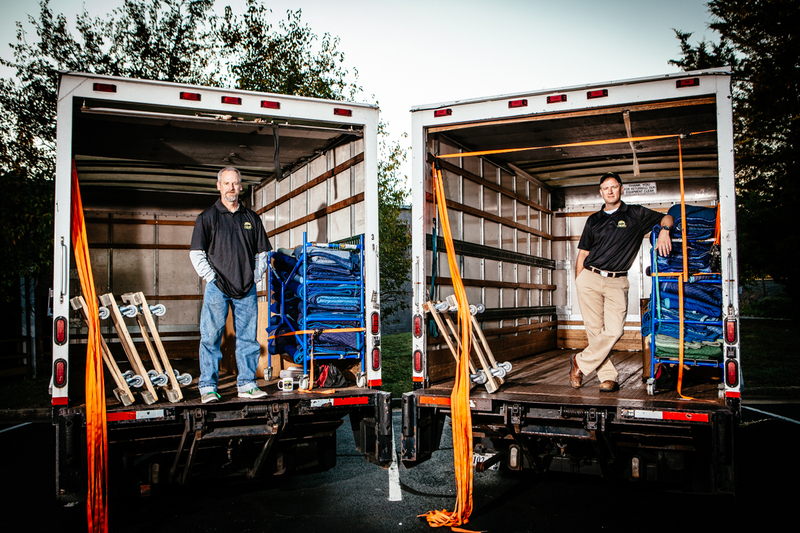 Unless you get an unusually good rate, a rental truck is almost certain to cost you more than whatever a moving company initially advertises, often more. What’s your time worth to you? If you read the “gurus,” they have all kinds of ways of putting a numerical figure on your time. Even if you don’t know that your time is worth $X/hr or day, moving yourself will undoubtedly make a withdrawal from your temporal account. This is why the majority of our customers hire us — we give them back their time. While this is hardly rocket surgery, there is a skill set involved, and with the combined experience of thousands of moves, we have it as close to a science as we can get. Many people are tempted (once) to skip a rental truck altogether and move everything by themselves. It’s an option, and yes, often cheaper — until you put a dollar figure on the value of your time. I’ve done it myself, both before and after I started this company. One four or five-hour moving block is far more preferable than dozens of hours spread out across several days of your “free” time after work and on weekends. And, of course, even the most physically fit people can still get hurt. One wrong lift and you’re out of commission. I was getting out of the family car a couple of years ago and twisted the wrong way. I was in a back brace for two weeks. One guy on our crew was impossibly fit and built. He was injured on the job and hasn’t worked for more than a year. All he did was pick up a box the wrong way. Naturally, we want you to use MTB, but in case you don’t (or we’re booked), here are some things to consider to avoid moving day chaos and surprise expenses. Most moving companies ask you to fill out an online form for an estimate. If you do a lot of shopping around, that can be a LOT of writing. Sure, you can use the same copy over and over, but you’ll still be doing a lot of copying and pasting. Instead, it’s much better to choose two or three top-notch companies and start there. We recommend Yelp.com, of course (not just because of our 500+ 5-star reviews), but another good resource is Angie’s List. Sites based on word-of-mouth are usually pretty good. And if your Top 3 candidates are all booked, ask them for referrals – good companies tend to know who the other good companies are. You’ll often see a mix of reviews on these sites. Some good, some bad. In general, if there’s more good than bad, you’re probably fine. The closer you get to 50/50, the more you might want to be cautious. On the other hand, if they have nothing but positive reviews, be wary. I do know of a few companies that “cook the books,” so to speak, and manipulate the rankings. We don’t do that A) because it’s wrong, and B) because we want our merits to shine through. Every one of our reviews on Yelp and Angie’s List are 100% genuine. Also, ask your friends and family in the area and back up their opinions with a little research online. People tend to remember their movers — either because their experience was a nightmare or because they exceeded really low expectations. 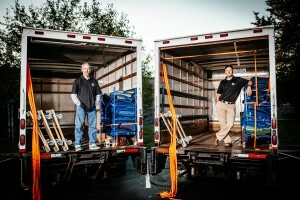 There are numerous moving websites where cut-rate moving companies advertise. They usually offer unbelievably good rates compared to bigger, more established companies. 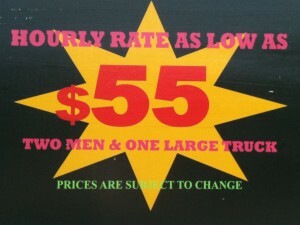 $55 per hour for three men and a big truck? Sounds great, right? Well, it’s usually too good to be true – these types of companies usually charge a minimum regardless of how small your job may be. And then there are the hidden fees. We once pulled up to a loading dock where someone else’s customer was crying near the “other guys’” moving truck. By our estimate, it was maybe 25 feet. $125 extra for that? Yeah. MTB exists to serve that market between the do-it-yourself move and the “Big Guys.” To appeal to that market, we have to keep our rates as low as possible. And if you’re a legal company, your overhead is massive. (As of this writing, bare minimum monthly overhead for us is around $30,000.) So, these guys who have one truck in their fleet, charge around $60/hr, and claim to be licensed, insured, and paying taxes? No way. I handle our finances and see what it takes to run a legitimate moving company. The costs are astronomical. “Prices are subject to change.” Yeah — often after your stuff is on their truck! Why is this important? You have to ask yourself whether you’d trust guys who willingly or perhaps even ignorantly fail to “pay their dues” to move your things. If they’re not paying for workman’s compensation insurance, for example, that says they don’t even care about their own guys. If they don’t care about the guys working for them, what does it say about whether they care about you? Whatever you do, don’t put down a deposit unless you’re absolutely satisfied that the company you chose has your best interests in mind. You’ll likely never see that deposit again. Do you charge for travel time? 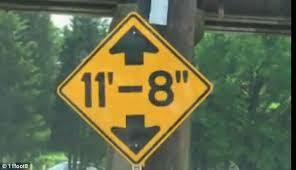 (This means travel TO your current residence and sometimes even from your NEW residence back to their headquarters).